Martin de Porres a lay brother of the Dominican Order who was beatified in 1837 by Pope Gregory XVI and canonized in 1962 by Pope John XXIII. The patron saint of mixed-race people and all those seeking interracial harmony. Noted for work on behalf of the poor, opened an orphanage and a children's hospital. He maintained an austere lifestyle, which included fasting and abstaining from meat. Among the many miracles attributed to him were those of levitation, bilocation, miraculous knowledge, instantaneous cures, and an ability to communicate with animals. Juan Martin de Porres was born in the city of Lima, in the Viceroyalty of Peru, on December 9, 1579, the illegitimate son of a Spanish nobleman and a black former slave, who was born in Panama. He had a sister named Juana, born three years later in 1581. He grew up in poverty when his mother could not support him and his sister, Martin was confided to a primary school for two years, then placed with a barber/surgeon to learn the medical arts. This caused him great joy, though he was only ten years old, for he could exercise charity to his neighbour while earning his living. Already he was spending hours of the night in prayer, a practice which increased rather than diminished as he grew older. At the age of 15 he asked for admission to the Dominican Convent of the Rosary in Lima and was received first as a servant boy, and as his duties grew he was promoted to almoner. Eventually he felt the call to enter the Dominican Order, and he was received as a tertiary. Years later, Martin de Porres miraculous cures led his superiors to drop the racial limits on admission to the friars, and he was made a full Dominican. It is said that when his convent was in debt, he implored them: "I am only a poor mulatto, sell me." Martin was deeply attached to the Blessed Sacrament, and he was praying in front of it one night when the step of the altar he was kneeling on caught fire. Throughout all the confusion and chaos that followed, he remained where he was, unaware of what was happening around him. When Martin de Porres was 34, after he had been given the habit of a Coadjutor Brother, Martin was assigned to the infirmary of that , where Martin de Porres was placed in charge and would remain in service until his death at the age of sixty. His superiors saw in him the virtues necessary to exercise unfailing patience in this difficult role, and he never disappointed them. It was not long before miracles were attributed to him. Saint Martin also cared for the sick outside his convent, often bringing them healing with only a simple glass of water. He begged for alms to procure necessities the Convent could not provide, and Providence always supplied.One day an aged beggar, covered with ulcers and almost naked, stretched out his hand, and Saint Martin de Porres, seeing the Divine Mendicant in him, took him to his own bed. One of his brethren reproved him. Saint Martin replied: “Compassion, my dear Brother, is preferable to cleanliness. "When an epidemic struck Lima, there were in this single Convent of the Rosary sixty friars who were sick, many of them novices in a distant and locked section of the convent, separated from the professed. 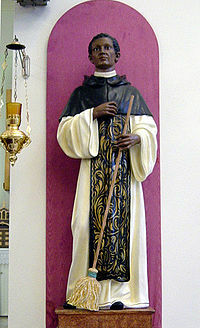 Saint Martin de Porres is said to have passed through the locked doors to care for them, a phenomenon which was reported in the residence more than once. The professed, too, saw him suddenly beside them without the doors having been opened. Martin continued to transport the sick to the convent until the provincial superior, alarmed by the contagion threatening the religious, forbade him to continue to do so. His sister, who lived in the country, offered her house to lodge those whom the residence of the religious could not hold. One day he found on the street a poor Indian, bleeding to death from a dagger wound, and took him to his own room until he could transport him to his sister’s hospice. The superior, when he heard of this, reprimanded his subject for disobedience. He was extremely edified by his reply: “Forgive my error, and please instruct me, for I did not know that the precept of obedience took precedence over that of charity.” The superior gave him liberty thereafter to follow his inspirations in the exercise of mercy. In normal times Saint Martin succeeded with his alms to feed 160 poor persons every day, and distributed a remarkable sum of money every week to the indigent. To Saint Martin the city of Lima owed a famous residence founded for orphans and abandoned children, where they were formed in piety for a creative Christian life. This lay brother had always wanted to be a missionary, but never left his native city; yet even during his lifetime he was seen elsewhere, in regions as far distant as Africa, China, Algeria and Japan. An African slave who had been in irons said he had known Martin when he came to relieve and console many like himself, telling them of heaven. When later the same slave saw him in Peru, he was very happy to meet him again and asked him if he had had a good voyage; only later did he learn that Saint Martin had never left Lima. A merchant from Lima was in Mexico and fell ill; he said aloud: “Oh, Brother Martin, if only you were here to care for me!” and immediately saw him enter his room. And again, this man did not know until later that he had never been in Mexico. Martin de Porres was friendly with both Saint John de Massias and Saint Rose of Lima. When he died in Lima on November 3, 1639, Martin was known to the entire city. Finished reading about St Martin de Porres, to look at some more saints click here.